Special Containment Procedures: SCP-2484-A is to be kept in a standard Refrigerated Perishables locker. Security clearance of Level-3 or higher is required to access SCP-2484 or any amount of SCP-2484-A. During testing, no more than 400 g of SCP-2484-A should be removed. No potentially destructive tests are to be authorized for SCP-2484 at this time. Description: SCP-2484 is a jar containing approximately .95 liters (1024 g) of a substance that is compositionally identical to mayonnaise, hereafter referred to as SCP-2484-A, that possesses numerous anomalous qualities that begin to manifest when the substance is removed from the jar and consumed by a vertebrate animal. When SCP-2484's contents are removed, it will begin spontaneously refilling at a rate of approximately 2 mL an hour. SCP-2484-A is able to be destroyed by any means applicable to non-anomalous mayonnaise. 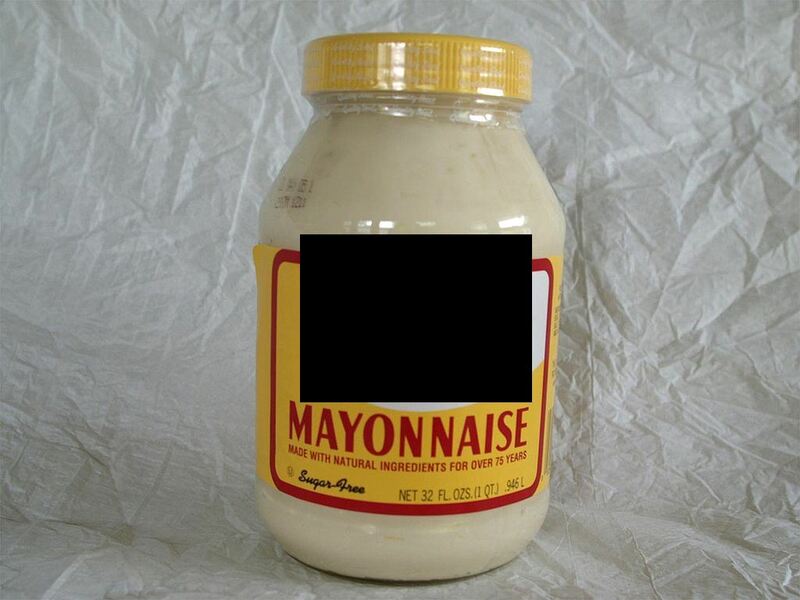 Any amount of SCP-2484-A less than 5 g does not display unusual properties, and is indistinguishable from typical mayonnaise. Masses between 5 g and 63 g will begin to develop a congealed membrane over their surface, and begin slowly locomoting via crude pseudopod-like structures, seemingly without direction. Any mass of SCP-2484-A exceeding 804 g (up to the full mass of 1024 g) will violently force itself into vertebrate animals, most often through oral orifices, although occasionally resorting to forcefully pushing through the skin. Secondary anomalous qualities will begin manifesting if a subject ingests a sufficient quantity of SCP-2484-A (approximately 3 g per kg of body weight). When a subject has consumed enough SCP-2484-A, its metabolism will be altered slightly, typically resulting in higher blood sugar levels, elevated heart rate, increased body temperature, and decreased brain function. After consumption, the subject will begin metabolizing SCP-2484-A into small, gamete-like cells via a process that is not yet understood. Over the next 3-6 hours, these cells will develop into small (~1 mm) nematoid worms. Approximately 500 worms are produced per gram of SCP-2484-A consumed. For the next 5 to 40 hours, these worms will begin to consume the tissues of their host organism, and will grow to lengths of up to 12 cm. When the host has been completely consumed, the worms will attempt to eat each other, and will proceed until only one worm is left, which will have grown to a length between 20 and 30 cm. This organism will then enter a dormant state, and will die within 4 days. If worms are removed at any point, they will die within 5 hours. No attempts to save affected organisms have met with success, and consumption of sufficient amounts of SCP-2484-A is always lethal. Addendum-2484-1: SCP-2484 was recovered on 9/9/20██, from ████████ Sandwich Shop, in ██████████, Massachusetts, after Foundation operatives intercepted several reports of unusual parasite activity. SCP-2484 was found in a refrigerator alongside several other non-anomalous jars of mayonnaise and other food items. When questioned, staff could not explain where SCP-2484 had come from, and had no memory of how long it had been in the refrigerator.1 After confiscation of SCP-2484, all ████████ Sandwich Shop employees and 14 medical and EMS personnel, were given Class-D amnestics. Addendum-2484-2: The following is a transcript of the ingredients listed on SCP-2484’s label. Water, vegetable oil, vinegar, eggs. Eggs. EGGS. EAT. EGGS. BE. EGGS. YOURE FLESH IS BUT THE NURSERY AND SUSTINENCE OF OUR INCALCULABLE RAVENOUS MOUTHS. EAT EGGS. CONSUME US. LET US BE REALIZED WITHIN YOU, sugar, salt, lemon juice, and love. 1. Unusual parasite activity reports dated back 10 weeks, consisting of 38 cases of confirmed SCP-2484-A consumption.